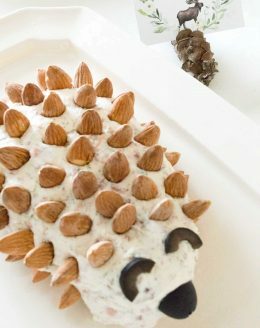 This adorable Hedgehog Cheese Ball is the ultimate Cheese Spread with almonds, green onion and bacon! Combine cream cheese, mayonnaise, bacon pieces and dill weed. Fold in green onion, salt and pepper. Refrigerate covered until solid. Shape into a ball, pine cone or hedgehog. Insert almonds into the cheese spread in rows. Optional: cut olive in half, use for nose. Slice olive and cut it in half and press in for eyes.